Like I mentioned when I talked about The Giveaway, I’d ordered the other two books based on the Burn Notice TV series, The Fix and The End Game, to read during my vacation earlier this month. I could definitely tell that The Fix was the first novelization from the series. Having read the third book in the series already, it was noticeable how much more comfortable Tod Goldberg has gotten with the characters. Most of the issues I noticed were small repetitions and odd word choices in the dialog, nothing that interfered with my enjoyment of the story. The one major problem I had, with The Fix, was a difference in how Tod handles changes in perspective from Michael to Sam and Fiona. The book sets it up like Michael is still narrating based on what Sam told him afterwards, but it didn’t feel quite right to me and leads to some confusing chronology. The End Game was much closer, in quality, to the third novel than the first. Tod drops Michael as narrator when switching to sections focuses on Sam and Fiona. There were also less of the small repetitions and odd word choices in dialog that popped out at me in the first book. 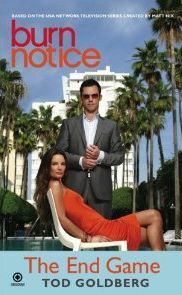 Despite the small problems mentioned above, I would still recommend these books to anyone who is a fan of the show and wants to experience a bit more of Michael Westen’s life. They are all quick reads and make excellent vacation reading. Tod has a fourth book The Reformed due out in January, according to Amazon, that I’m looking forward to picking up.